Kovalam beach town consists of many beaches; among them three beaches are mostly popular because of their grace and the scope for beach activities offered. These three beaches are: lighthouse beach, Hawah Beach and Samudra beach. Lighthouse beach is exclusively dedicated for the tourists while in the other two beaches, you will also see lots of fishermen. Wooden shipping boats are the common sights in these two beaches. However, tourists can stay and enjoy the ambiance of all the Kovalam beaches and the activities there. 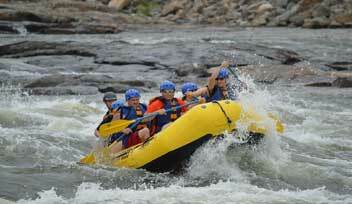 Adventure sports in Kovalam are renowned worldwide. The beaches of Kovalam offer breathtaking view of the Great Arabian Sea and along with that for the adventure lovers, a lot of adventure sporting facilities are there. Kovalam beaches have clear water which compels anyone to jump in for some casual swimming. This is the least risky activity here but still you should be careful to be in the safe zone. Some of the common adventure sports, include - Para Sailing Windsurfing, water skiing, boat sailing, etc. Before going for it, assure that you are medically fit to perform the task. Every activity here is really a fun but you should indulge in them with extreme care. In case of para-sailing, make your ground assistants to check the flight harness and rig before you take off. The concerned crew will avail you a briefing regarding safety tips which will cover the evacuation steps, way of using hand signals and they will describe in detail about the parasailing experience which you will encounter. Listen carefully and memorize it because even though chances are less, if any mishap occurs, shouting audibly is virtually impossible once you start. So, you should be effectively able to communicate with the crew regarding your status. For a ravishing beach life experience, Backwater Cruiser is a must do thing at Kovalam. Riding country boats and exploring the wide and infinite marine water would be an amazing experience. Through this you will get the chance to get close to the water, observing its mystery and wild life. Houseboat, country boats, etc. facilities are available from all beaches of Kovalam. Catamaran ride skiing is also another great option and available in all beaches here. Apart from all these stuffs, swimming and kayaking are other common water sports of this place. Explore the zeal within you through these adventure sports! Beach activities in Kovalam is many times the sole factor attracting tourists from all around the globe to this place. You can enjoy them with great rejoice!